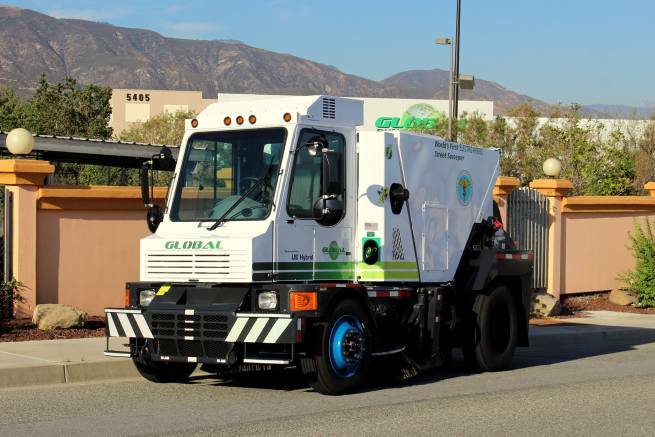 Global Environmental Products, based in San Bernardino, California, brings a combined 60+ years experience in the street sweeper industry. The company's extensive product distribution network spans more than 45 dealers throughout the United States and Canada. The company was founded initially to support the Allianz Dealer and User Networks when Allianz went out of business in early 2011. 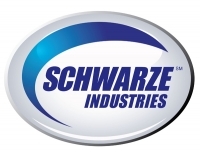 The company began by supplying OEM parts for Allianz-brand machines before quickly branching out to offering a wide variety of sweeper parts to fit other brands. In the interim, Global has become known for providing the first-ever diesel/electric hybrid sweeper, as well as the first fuel-cell powered sweeper. In addition to its own line of regenerative air and mechanical broom sweepers, Global Environmental Products is an OEM sweeper parts distributor and dealer for Python sweepers. 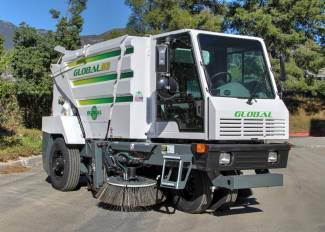 Global sweepers are produced on both standard and purpose-built chassis. The latter are made by chassis manufacturers that include Peterbuilt, Freightliner and Isuzu. In many cases, purpose-built chassis provide exceptional operator visibility and comfort, in addition to superior sweeping capability. Single- and dual-engine models are also available, depending upon the model. For example, the Global M3 is powered by an electrostatic drive and has an exceptional 12.5' turning radius. 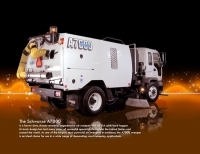 This makes it possible to sweep narrow downtown streets and tight cul-de-sacs with ease and efficiency. With our 'heavy sweep' package, the M3 is capable of sweeping up as much as a ton of debris every minute! The 5.6 cu/yd hopper is one of the largest in the industry and offers a high dump clearance of up to 116". Plus, when sweeping the Global M3 operates at a quiet 76 dBA. Imagine, sweeping at night with no noise complaints! The Global M4 Hybrid offers over a 50% increase in fuel economy, as compared to diesel-powered sweepers, as well as reduced emissions and noise levels. Wondering about the speed of purpose-built chassis on the highway? The M4 can travel at speeds up to 60 mph. The Global M4 also has been designed with a special equal-width pickup broom and elevator system, which makes it capable of removing extremely large amounts of debris. It also has a 'leafgate system' that is controlled from within the cab that allows the sweeper to handle bulky debris such as branches and limbs. The M4 is available in both high and low dumping configurations. Global's V Line of sweepers, like the V4Air model shown, include our patented Variable Air Stream (VAS) Technology, something not available on any other sweepers in the world. VAS is an air recycling system that constantly recirculates the air from the sweeper to the suction box, and which can be adjusted to recycle between 30-70%. As a result, the Global V4Air emits less than 50% the amount of fine dust than that of a suction sweeper. The V4Air also can operate in temperatures as low as 23-degrees F because the circulating air in the system is warmed to @59-degrees, which prevents the water in the suction shaft and hopper from freezing. 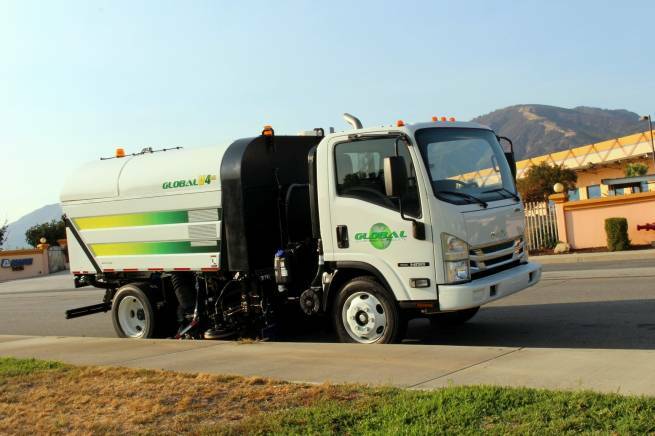 Plus, even though the V4Air offers all the performance of a full-sized sweeper, due to its compact design and mounting onto an Isuzu 19,500 GVW chassis, no CDL license is need for operation. As you can see by reviewing just the above three of Global's seven different models, when you are in the market for your next sweeper you owe it to your organization to include Global in your demonstration mix. 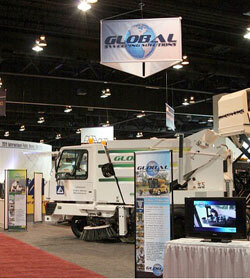 We're confident that when you do you'll specify the purchase of one of Global's leading sweeper designs! For more information, or to find the dealer nearest to you or arrange for a personal demonstration from a Global professional, give us a call today at 909-713-1600, send an email to info@globalsweeper.com, or visit our website, www.GlobalSweeper.com.